Interview With Edward "Doctor Bench" Dudley-Robey, M.D. CRITICAL BENCH: Tell us about yourself. Doctor Bench - I'm a 35 year-old physician who lives with two dogs and four cats, a big-screen HDTV and a motorcycle. 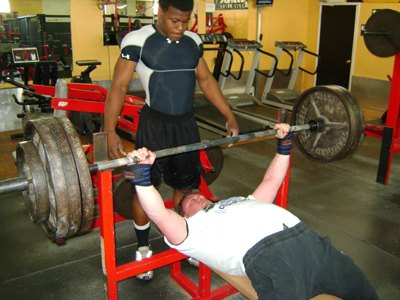 CRITICAL BENCH: Tell us about your new big bench press site and what it is about. Doctor Bench - www.DoctorBench.com is the beginning of a new chapter in my career. It's going to bring together my lifting and awards, clinical research applicable to sports sciences, innovations in training, equipment, and supplementation: in an environment to which every athlete can relate. 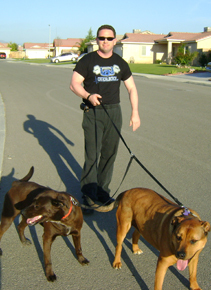 We are also going to form a lifting team here in the Bakersfield / SFV, CA area that the site will highlight as well. CRITICAL BENCH: List 5 things that you have achieved in bench pressing life that you are proud of and write a little about each. Winning the World Bronze Medal last year at the GPC world championships in England. It is always in honor to represent your country, and to bring home a little hardware was a great personal thrill. Winning the 2007 APF California State championship. This was my first major win and set me on the path to my present achievements and future goals. Taking the bronze medal at the 2007 APF senior national championship. Brad Heck killed me, yet this is where I earned my first ticket to a world championships, and learned a lot about what it takes to be a champion. Competing for the United States of America at the 2007 WPC world championships in Russia. Even though this contest was a complete disaster, (The worst run hands down, I have ever attended) there was a proud feeling to representing the United States. I also had the opportunity to visit orphans and disadvantaged children of that region: the memory of them made the whole experience worthwhile. To this day, the vase they gave me is the most prized possession of my lifting career. May God bless them. The variety of different environments in which I have been able to have success. This year in France, will be the fourth country in which I have competed. A true champion is not someone who just hits big numbers in their home gym, but will test themselves against the best in the world no matter where that is. I've set 16 records in five different federations over two different weight classes with every combination imaginable: raw, single ply, and multi-ply equipment. Powerlifting is such a diverse sport, with major talent everywhere, that you learn to be flexible if you want the whole experience. CRITICAL BENCH: Tell us about your job. Doctor Bench - currently I'm finishing up a fellowship in Pain Management/Addiction medicine. This will be a huge asset while moving forward through residency, and into clinical practice. I always want to stay involved with sports, and unfortunately injuries are a huge part of this. The knowledge I have gained will make me better able to serve athletes in the future. CRITICAL BENCH: You are a World's Bronze Medalist. Tell us about the experience Doctor Bench. Doctor Bench - it has been a roller coaster ride. It was the thrill of a lifetime to stand onstage wearing the United States flag to accept the medal. There was a great deal of stress involved with the contest: lack of sponsorship, travel, lack of a team for support, not having a designated liftoff person, and being the only American in the open division. I was certainly in a pickle, but at the last moment, a couple of the British lifter's demonstrated their splendid sportsmanship, by stepping-up to help me get my shirts on and wrapped. In the end it was all worth it. Naturally, it would have been great to have taken home the gold, but I hope to rectify that at this year's world championships. 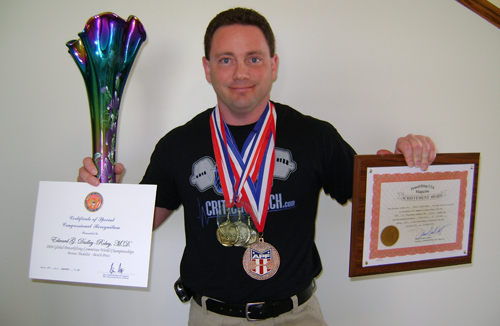 CRITICAL BENCH: What was it like being on the USA Powerlifting Team for 2008 GPC World Championships in England and the USA Powerlifting Team for 2007 WPC World Championships in Russia, Tell us about that. Doctor Bench - It has been my honor to twice represent the United States of America at world championships. I've made many friends, spent time with legends such as Ed Coan, and seen a bit of the of the world as well. It's a true learning experience, because you watch the best from the United States and dozens of countries around the world. Everyone there is a real competitor. There are no freebies or guarantees, and it's the challenge of a lifetime: a true trial by fire. Champions are made by who they beat, not numbers. If you want to be the best, the world championships is where you become a true champion. CRITICAL BENCH: Wow, that is a lot of records that you set! Which one are you the most proud of? Doctor Bench - probably the GPC North American and USPF division 2 records that I set at the GPC world championships last year. They're not my highest numbers, but the fact that I set them at a world championships in a single-ply shirt at a multi-ply contest sets them apart. CRITICAL BENCH: What are your future goals? Doctor Bench - I would like to win a gold medal in a world championship, (Who wouldn't?) and hope to bring one home from France this year. 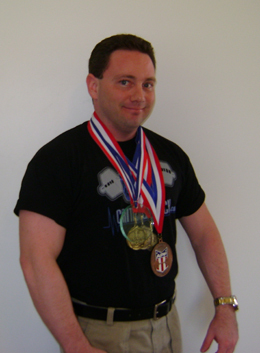 I want to keep climbing up on the Powerlifting USA and Powerliftingwatch.com rankings. The thing about goals and Powerlifting is that they're never consistent. The day after you hit one mark it goes up. CRITICAL BENCH: What was your bench journey like before you were setting all of those records? Do you remember days back when a 135lbs bench, 225lbs bench or a 300lbs bench was a big deal? Doctor Bench - I definitely remember the first time I hit those numbers, and it was a huge deal. One plate, two plates, three plates, four plates, five plates, etc.. every time you go up a plate on each side, it's a huge deal. My gym lifts are some of my most memorable. Generally, you'll hit weight in training for a long time before you ever hit it in competition so the first experience of making a lift normally comes with no one around but your teammates. CRITICAL BENCH: Tell us about the Media Exposure you have received so far? 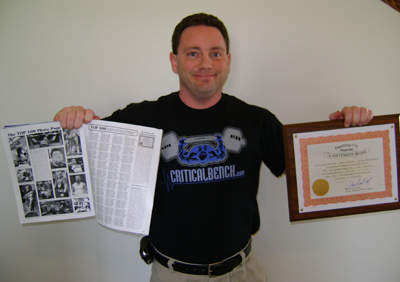 Doctor Bench - I am lucky in having received positive press from a variety of different environments: powerlifting magazines/web sites, medical journals/web sites, and sport sections in newspapers. Winning the world bronze medal, took me to another level of exposure, and I hope to the sponsorship needed to reach all of my goals. CRITICAL BENCH: Being a bench press expert and a Doctor, what are your 10 do's and don'ts for a bigger bench press? Consistency in training (every week, rain or shine) - Powerlifting is a marathon, not a sprint. The longer you train, the better lifter you become. Have a good recovery program - remember you don't get any stronger in the gym itself. while you're working out you are putting micro fiber tears in the muscles. These muscles repair themselves getting a little bigger in a little stronger each time, but they must have the recovery time. Spend time with other top lifters - nothing replaces the motivation and feedback that a group of other lifters can give you. It's also good way to compare yourself and learn from others. Realistic goal's (no one starts as a 500 pound bencher) - set a goal, work hard, achieve your new PR, repeat. If you're constantly setting new personal records it won't be long before you're setting national records! Good diet - you are what you eat. Don't expect a Formula One race car to run on pump gas, it needs racing fuel. If you want to perform like a Formula One car, maintain and feed yourself like one. Correct supplementation program for you (everyone is different) - Don't just believe everything you read in an advertisement. Do your research learn what the supplements are and figure out which ones are best for you at the stage you are in your career. 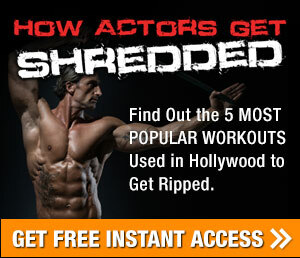 It's like a key fitting a lock, a supplement might be the world's greatest key but if it doesn't fit you its useless. Remember, no supplement adds 100 pounds to your bench without hard work. Good equipment - maintain your gear and replace it if necessary. Remember as you get stronger you will need stronger equipment to handle what you are doing. Make sure that bench shirts fit correctly, your wrist wraps are not worn out. Currently, I am sponsored by Titan and APT and they definitely make some of the best equipment in the business. Get treatment for injuries (don't just push though major injuries) - this is a huge mistake that lifter's make all of the time. Even I have been guilty of this. Remember, a small injury can be treated quickly but if you let it progress to a large injury that can put you on the shelf for months. Warm up, and use liniment on the areas you're going to be working - This is a big help. I'm currently using FlexPower which is a gradually heating liniment to help warmup the body parts I'm lifting on that day. 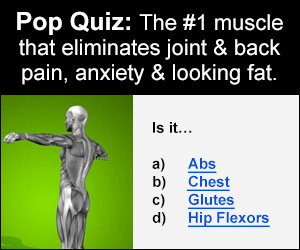 Not only will this reduce pain, allowing you to lift more, but it will also help prevent injuries. Anything you can do to prevent injuries is worth its weight in gold. Support work, support work, support work, support work - we all love to bench, and we all hate the support work that goes with it. Stronger back means more stability, stronger triceps mean better lockout, stronger legs mean better leg drive, etc..
CRITICAL BENCH: How do you see the future of the bench press? What can you do to help it? Doctor Bench - I think that, not too long in the future, you will see Powerlifting as an Olympic sport. Walk into any gym in the world and the first question, everybody asks isn't about your clean & jerk, but what do you bench press? If the Olympics can find room for ballroom dancing and chess, there must be room somewhere for the truest test of strength on the planet, Powerlifting. Unfortunately, by the time this comes around, I will probably be retired, However, I hope to be an ambassador for the sport and to help guide the next generation of lifters to success. CRITICAL BENCH: Give us your bench press routine! Doctor Bench - I train bench press twice a week. I have a speed day and a maximum effort day. Usually Wednesdays is my speed day. I warmup to about 315 on a flat bench then after a couple of sets, I move on to my second exercise. For speed days, I tend to vary it however one of the big ones is five sets of three reps and three seconds to help gain explosion off the chest. On other days I'll train using bands or chains (though they can be hard on the elbows), floor presses and maximum repetition sets. Support work then follows: close grip bench, pin presses, hammer curls, triceps and back work. Occasionally I throw in a set a bicep curls just to help fill out the bench shirt but this is not an emphasis. Saturday's are usually my maximum effort day. I'll warm-up to about 315 RAW for one or two sets then break out the shirts. My first set depending on the day and equipment is somewhere between 400 and 450 pounds, second set is generally between 450 and 500, and sets beyond that depend on the goals for that training cycle. At the beginning of the cycle I do these sets to a two board, middle of the training cycle to one board and toward the end of the training cycle all the way to chest. Occasionally, I will still do the first shirted set all the way to the chest, no matter where I am in the training cycle, just to have a good feel of what it will take to touch when I need it to. Support work and second exercises follow the pattern of my speed days just at a heavier weight. CRITICAL BENCH: How often do you change your bench press routine? Doctor Bench -All the time! I rotate in and out exercises not only for a change, but to shock the muscles. I love going to train with new people because I get to steal from their routines the things which might be a benefit to me and incorporate them into my training programs. However, the core basics when you are a competitive bench presser tend to stay the same. CRITICAL BENCH: What are your favorite assistance exercises for building that bigger bench press? Doctor Bench - Favorite might be the wrong word. The ones I focus on the most are the lifts that build on my weakness which is lockout, and that means triceps. I normally have good strength off the bottom good arch and good speed. Where I need to improve most is at the top. CRITICAL BENCH: What is your favorite thing about the bench press? Doctor Bench - When I'm lifting the rest of the world doesn't exist. The gym is my sanctuary, no work, no bills, or any other stressors matter, because I must be fully focused on the weight, or it will crush me. I work in a very cerebral environment, and the balance I get from lifting is invaluable. CRITICAL BENCH: What goes through your mind before benching a new personal best? Doctor Bench - Depends on where I am. If I'm in the gym and its the first time I've ever handled the weight it's probably thank God there are good spotters and liftoff people! If it's in a competition, I know that I have been hitting a weight in the gym for along time and now it's time to just do what I have been training for this entire time. CRITICAL BENCH: What is your goal in regards to your website? Doctor Bench -To grow into a home for applied sports science that athletes can use. I just teamed up with Dr. Eric Ip of Touro University in California and his research team to start doing projects, which will produce data directly applicable to Powerlifting. 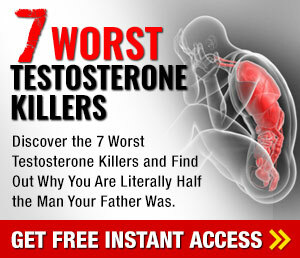 I've done some award winning research before and I think this is a great opportunity to bring top-of-the-line research to the people who need it most- the competitors. I would like to see the site become a world-class resource for credible sports science that can be applied on a day-to-day basis. 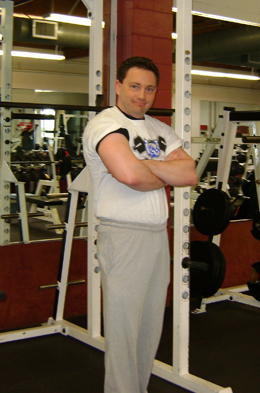 Then I'm also working on putting together a bench press video for the web site that will allow fans to get ideas for their training routine. 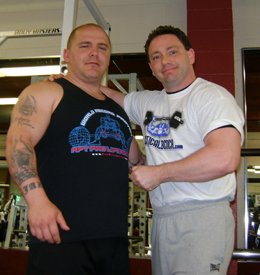 I plan to bring in a couple of other big lifter's in other weight divisions so that the video applies to everyone. CRITICAL BENCH:You have had an amazing bench press journey. How are you going to remember your bench press journey? Doctor Bench - As my personal best. Eventually someone will break my records. Federations come and go, yet once a champion always a champion. Pain heals, but glory lasts forever. CRITICAL BENCH: Dr. Bench, it has been fun. In closing who would you like to thank? Doctor Bench - James "Priest" Burdette for all his help, Pete from Titan, Alan from APT, Ken from FlexPower, my agents Michael and Tom at FK Sports Management, all of my friend's, family, supporters and my mother (Who would never forgive me if I didn't).